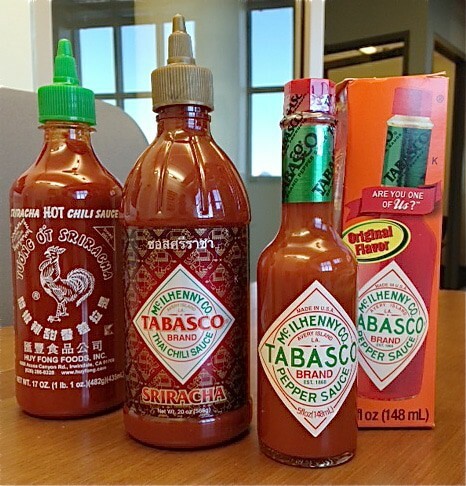 Until recently, Sriracha and Tabasco have been – at least I thought – living in their own worlds. So, during my latest shopping excursion, I couldn’t help but be attracted to the packaging for McIlhenny Tabasco Sriracha, intriguing me not only with beautiful packaging graphics but also with the idea of finding a new hot sauce combination. First, I was amazed at how the category of hot sauce has expanded and impressed with the wide variety of sauce styles. Second, Tabasco packaging is one of the few instances where the product is put on shelf in a protective carton – I found it very effective that the cartons provided an immediate visual advantage in the category by creating an eye-stopping color field to surround, support and emphasize the brand. 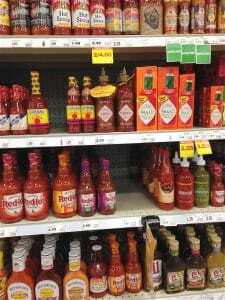 Honestly, I was surprised at the Sriracha bottle placed on shelf directly next to Tabasco packaging, with what my eye immediately saw as the familiar McIlhenny Tabasco logo/brand. Initially, I might have thought this is Tabasco sauce, but upon closer examination, I discovered the nuanced changes in the McIlhenny logo/brand, including a typographically bolder treatment of “Tabasco” and substituting flavor/style specific product copy. Instead of relying on a strong red as the principle package color like most hot sauce packaging, McIlhenny added an elegant background pattern of golden elephants, which rise out of a color gradient based on a slightly darker value of the product color and gold, creating a luminescence on the package that immediately sets the product apart from its competition. The inclusion of Sriracha below the logo, using a second gradient of dark to light red within the copy, reinforces the concept of a hot product, without being too loud. One last point that has nothing to do with the packaging but more to do with product placement, which I know varies by retailer. In this instance, I understand that as a hot sauce and as a part of an established product line, it makes sense that this would be positioned with the hot sauces on shelf. 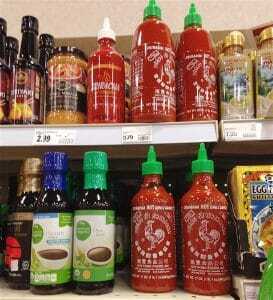 However, as Sriracha it seems to make more sense to put it on shelf as a competitive alternative to the ubiquitous Tương Ớt Sriracha hot sauce in Asian condiments. Better yet, why not have it on shelf at both places as well as with cocktail ingredients? After all, there is nothing better than Sriracha in a Bloody Mary! As categories become more and more dense with options, it is increasingly critical that package design competes, disrupts and stands out on shelf. I admire the commitment McIlhenny has made to create a strong brand system that is conveyed across all SKU’s in their product line. Brand, as the single most important communication element, should always be supported by minimal purpose driven copy and managed uniformly across product, flavor and style variations and color cues – making it simple to connect directly back to the brand. That is the sole purpose of a well thought out packaging design system.